Now the game doesn't have Unicode support anymore! Ah well, I'm sure it'll make it back in some time. In the meantime, this is SO stickied! nathantcash: I would welcome a new version with fixes. That's the reason the source is being shared. I asked people to post replies with updates to the code, but I doubt I'll take the time to implement them unless it fixes a game breaking bug or adds a really cool feature. I spent a lot of time on this update, but I'm moving on to something else. I'll leave future updates for people that actually enjoy working with Game Maker. KarjamP: Yeah, the lack of unicode support is sad, but there wasn't much I could do about it. Game Maker for Mac just doesn't support it. Here's hoping that someone can get this running in Game Maker Studio. I hope to see Spelunky in multiple languages and running on Android and IOS someday. Wonkyth: Thanks for the sticky! It ran well on my old Mac Mini (2006 model, runnning OS X 10.6). The only odd thing was that it displayed the numerical keyboard codes instead of the key names in any on-screen messages. "PRESS 32 TO JUMP." Might be confusing for new players. Thank you Moloch for the bug report. I didn't experience this issue, but I'm guessing that's for two reasons. The first reason is that I use a Windows keyboard with my Mac. The second reason has to do with a known issue with Macs regarding the period key and the fix I made regarding the Enter key. The "period" key acts like the "Delete" key in the "Level Editor" and "Load Level" screens. Fixed "Enter" key not registering in "Level Editor" and "Load Level"
Game Maker for Mac doesn't always behave the same way as its Windows counterpart. Certain keys are interpreted by Game Maker for Mac as other keys. I think a workaround could be done by editing the "scrGetKey" script with the "os_type" function and creating new cases for Mac keyboard keys. Unfortunately I don't have a Mac keyboard to recreate this issue and therefore can't test any changes made to the script. I agree that this problem probably is confusing to new users, but I don't have the time or the money to look into it further. Sorry if this isn't the reply you were looking for. I'm glad it ran well on your Mac and thanks for letting me know about the issue. Sort of. I briefly looked into the ENIGMA Development Environment when Game Maker for Mac and Game Maker Studio were giving me headaches. ENIGMA can compile Game Maker source code into a native executable with Linux as one of the valid targets. However, it's not finished yet and is missing some key functions that Spelunky's source relies on. I spent a day trying to get the code to work, but gave up and went back to Game Maker for Mac. 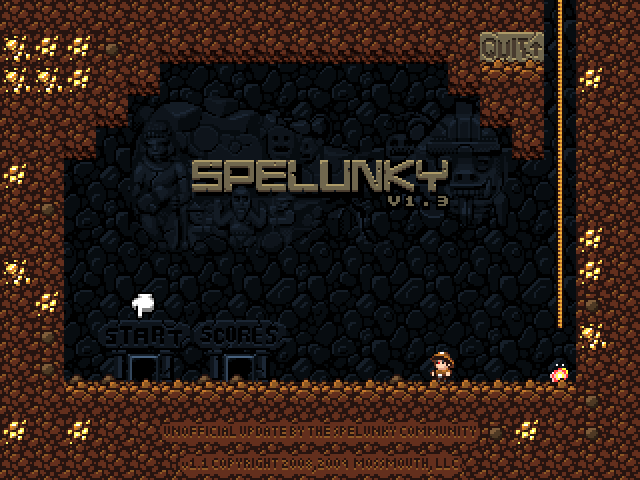 Perhaps in the future Spelunky will be able to run on Linux, but not yet. I guess you'll have to stick with Wine or a virtual machine for now. I'm using a windows keyboard too - a standard looking Logitech (wired USB, no extra custom keys) with Alt/Ctrl/Winkey. I don't think I tried playing with the default keys first, I used config to set up the keys I use before running the game the first time. The hint hand did work in Spelunky v1.1, but not as often as it should have. That's been fixed. The hint hand only appears the very first time you start the game.